Little Red Riding Hood may not have been as helpless as we all thought. 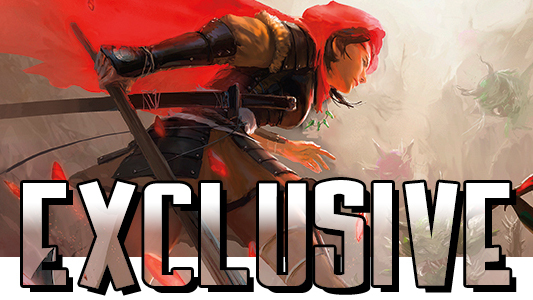 Dark Horse introduces us to a new take on the classic fairytale in Akaneiro. Written by Justin Aclin with art from Vasilis Lolos, we find a young girl eager to become a warrior in a world infested with demons. During a ceremony to the gods, the Japanese village of Ainu in which Kani lives is attacked by the Yokai—demons from another world. Two warrior women known as Red Hunters from The Order of Akane, are hot on the demons’ trail but are not able to get to Ainu in time in order to protect it. The Yokai takes over the body of the sacrificial bear, becoming a hideously grotesque beast. As her father is about to be slaughtered, Kani saves his life, attacking the monster with an ax and helping the newly arrived Red Hunters kill the Yokai. Once the mayhem has concluded, the Ainu elders seek war against The Order of Akane for their lack of help in preventing the devastation that has occurred. 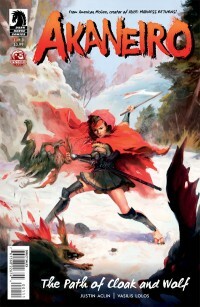 In a desperate plea to avert this outcome, Kani chooses to join The Order as a representative of the Ainu and both parties agree; but Kani, now donning a red cloak, will need to prove her worthiness to The Order of Akane by making a long and arduous journey on her own—in which Yokai and tricksters alike will stop at nothing to thwart her progress.